The Happy Hour at Corez Wine Bar previously scheduled for Thursday, May 7, 5:30 p.m., has been rescheduled to May 14, at 5:30 p.m.
Doesn’t get much lower than locking up kids for kickbacks. 1. Thursday, April 2, 5:30 p.m., Happy Hour, at Bull’s Head Tavern. 2. Wednesday, April 8, 12:00 p.m., YLS Meeting. Matt Kendall will discuss current issues in intellectual property law. 3. Friday, April 10, 7:00 p.m., Griffins Hockey Game. Contact Matt Kendall, kendall@vglb.com, to get on the waiting list. 4. Saturday, April 18, 9 a.m. to noon, Habitat for Humanity. YLS will be participating in the building of a home in the Grand Rapids area for Habitat for Humanity. We are looking for at least 10-15 volunteers to represent YLS – spouses, significant others, and friends are welcome!!! Anyone interested in helping should contact Courtney Schlipp (Courtney_Schlipp@yahoo.com) immediately so YLS can provide a tentative head-count to Habitat by April 3, 2009. 5. Thursday, May 7, 5:30 p.m., Happy Hour at Corez Wine Bar (http://corezwinebar.com/home/) in East Hills at 919 Cherry St. SE. Please join us on February 21, 2009 for the annual YLS Progressive Dinner. The progressive dinner is a great opportunity to get to know other young attorneys and their significant others in a relaxed, fun atmosphere. This year’s dinner will begin with appetizers and cocktails Raj Malviya’s house at 5:00 p.m. At around 6:00 p.m. we will break into small groups of six to eight for the entrée portion of the evening. Finally, at 8:00 p.m. we will reconvene as a group at Anna Rapa’s house for dessert. Please RSVP to Sara Shoemaker at slmaile@yahoo.com by February 11, 2009 if you are able to attend this year’s dinner. A vegetarian entrée is being provided, so please indicate that preference in your response. Prior to the event an email will be sent out notifying attendees of their dinner host for the evening as well as providing directions to the locations for the night. For many of us the end of the year means an increased emphasis on billing. Check out the soon to be classic, “I’m Billing Time”, performed by The Bar & Grill Singers, a group of lawyers from Austin, Texas, to put you in the right frame of mind. Instead, join YLS on Thursday night for a Bowling Night and Holiday Get-together. YLS has reserved lanes at Clique Lanes (533 Stocking Ave NW) starting at 7pm. YLS will provide the bowling and shoe rental, and perhaps throw in some food and beverage for all who gather. Please RSVP to Matt Kendall (Kendall@vglb.com). Family and friends are welcome! It took a little sweat, combined with a few tight parking spots and five-point turnabouts, to wrap-up this year’s Horn of Plenty food and clothing drive. The event proved to be a HUGE success – we filled two cargo vans completely full with food and clothing for the Baxter Community Center. The word “completely” is not to be defined lightly – one of the vans was so full that we had to start packing donations in between the seats in the passenger cab, and the other was jam-packed so that you could not open the side door for fear that bags of clothing and canned goods would literally fall-out into oncoming traffic!! On top of the clothing and food items, we graciously accepted over $1,500.00 in combined cash donations on behalf of Baxter Community Center, Meltrotter Ministries, In the Image, and God’s Kitchen. Thank-you to all who contributed to making this event a success this year, and here’s to making the event an even bigger success in years to come!!! Eva Aguirre Cooper will moderate a panel discussion featuring Mayor George Heartwell, Commissioner Eli Lumpkins, Mike Freed of Spectrum Health, Planning Director Suzanne Schulz and Rich MacKeigan, SMG General Manager. These community leaders will discuss the issues most important to young professionals in Grand Rapids. 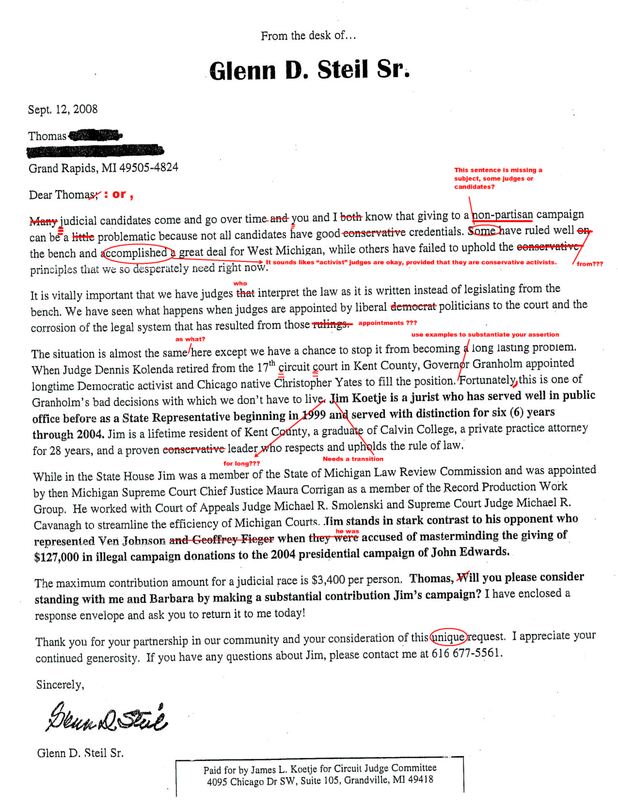 The Press article discusses a letter, paid for by the Koetje campaign, that is purportedly “From the desk of …” former State Senator Glenn D. Steil Sr. Have you seen the letter? It looks like it is “From the desk of …” a sixth grader. Seriously, who proof read the letter before it went out the door? It is September which means inter alia (my lawyer word for the day), there is little hope that the Lions will salvage their season; a few weeks from now, Cubs fans will have their dreams dashed in some “unforeseen” way (we know the little bears will grab defeat from the jaws of victory, but we don’t know how), and yes, the YLS year is underway! YLS Happy Hour, Thursday, October 2, 6:00 p.m. Come join YLS at Hopcat (25 Ionia Ave SW # 1, Grand Rapids, MI 49503). The first 15 people to arrive will receive their first drink on YLS (fine print: provided that the cost of such drink is within reason, as determined solely by YLS). YLS Meeting, Wednesday, October 8, at 12:00 p.m. The speaker for the October meeting is Kim Coleman, the Executive Director of the Grand Rapids Bar Association. Come meet Kim and discover the many services and opportunities available to young lawyers through the GRBA. The meeting is at Warner Norcross & Judd 111 Lyon Street NW, Suite 900 Grand Rapids, Michigan 49503. Lunch, pizza and soft drinks, are on YLS. No RSVP is necessary. GRBA Benefit Dinner, Wednesday, October 22. The Grand Rapids Bar Association and The Justice Foundation of West Michigan Benefit Dinner. This year’s speaker is Dr. Ronan Tynan, physician, Paralympic record-holder, and Irish Tenor. Dr. Tynan will speak and give a short performance. Tickets to this event are $60 for GRBA Members, $85 for non-Members. To register for the event, please click here. Doughnuts, Hayrides and More! Saturday, October 25, time TBA. Come join YLS for a family friendly event at Robinette’s Apple Orchard. We are planning the event around the Michigan v. Michigan State football game, also known as the battle for the Paul Bunyan – Governor of Michigan Trophy. Game time will be announced two weeks before the game, so stay tuned.